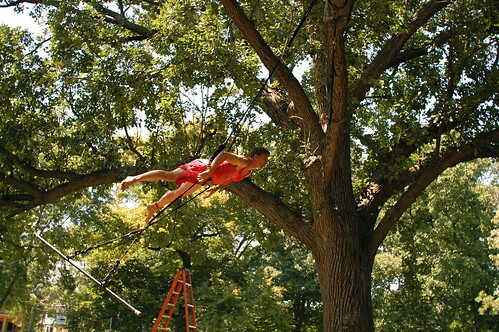 Cycropia is completing all the preparations needed to put on a dynamic aerial dance show at the Orton Park Festival. 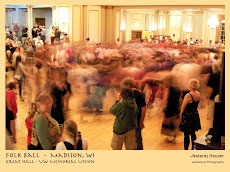 There are a million details that need to be handled, and many volunteers assist the dancers. Costumes need to be completed and fit. Music selections need to be finalized and delivered to the sound crew. Videographers need to be coordinated. The ground under the oak tree needs to be raked, and raked, and raked, and raked again to remove as many acorns, twigs, bark, and other things unpleasant to hit with a bare foot while running. 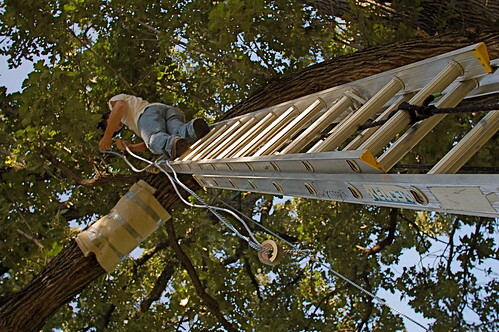 The tree needs to be rigged to accept the apparatuses that will be used. Lighting needs to be erected and power run to each light. 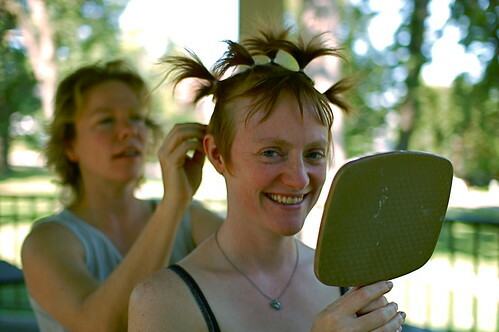 A "back stage" tent needs to be setup so dancers can change, do makeup, store costumes and props. And since not all these things can be done day-of-show, we need volunteers to park-sit to protect all the things that are in place. It is a LOT of work. Around all the work though, there are some benefits. Not the least of which is that we get to have our class in the park, in the tree the week prior to the show. For those dancer/students who are not performing in the show itself, it is a great opportunity to experiment with the differences between a trapeeze mounted to a static ceiling and one mounted to a swaying tree limb. 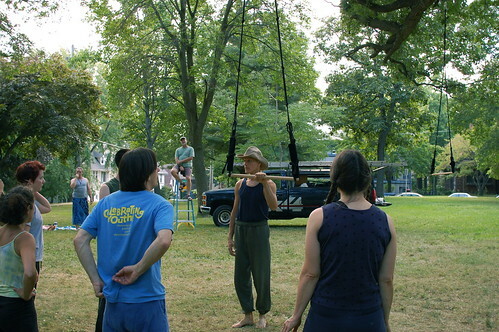 All throughout the week dancers get to set up their apparatus and get in some rehearsal time in the tree. It is needed for fine tuning the rigging as well as reacquainting the dancer to the dynamics of the tree. The show will be great (providing we do not get rained out! ), so come and watch. Much like the Concerts On The Square, the best spots get staked out early, with blankets holding space in the front row by noon for the 8:45 PM shows.